The Marsblade Ice Holder is setting a new standard in hockey. It increases hockey players on-ice performance with several benefits, such as higher speed, quicker turns and more powerful strides. Image above: Launching a new product, a new technology and a new brand that changes the basis for how hockey training is to be set up and how players can move in match situations means on many levels something new, says Per Mårs, founder of Flow Motion Technology with Marsblades. Photo: Marsblades. The Marsblade Ice Holder with the patented technology Flow Motion Technology was named this year’s innovation in Sweden by Sportfack, with the nomination: Marsblade Ice Holder is well on the way to change the hockey world. The fact that the innovation is developed in the small city of Östersund and also makes a difference in skiing does not make things worse. During the hockey season 17/18, the Marsblade Ice Holder was introduced in the Swedish Hockey League SHL with Växjö Lakers captain Liam Reddox, who took his team all the way to the gold medal. The season 18/19 the company reached a huge milestone as the product was officially approved and introduced in the world’s best hockey league NHL. 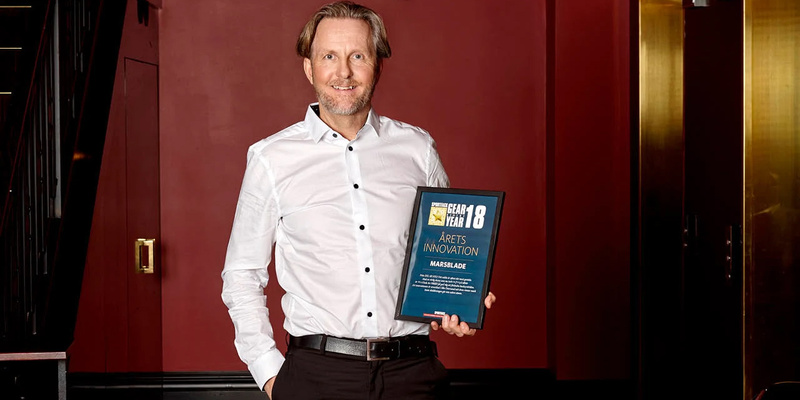 Hans Victor, CEO Marsblade, with the Innovation Award. “We are convinced that the Marsblade Ice Holder will be used by many key players in the NHL next season. We are well on the way to setting a new standard in hockey, just as the carving ski set a new standard in the alpine industry,” says innovator Per Mårs. “Investors and leading hockey brands have also shown great interest in the technology and we expect to start licensing discussions shortly,” says the company’s CEO Hans Victor.